I've added a "single page view" for a log that shows all the maps, graphs and tables that would be on separate tabs on a single page. This is best used for printing out the details of an activity as a PDF file (using something like PDFCreator) so they can be shared with other people. The best printer settings in FireFox appear to be about a 75% or so zoom, select "print background colours" (to show colours in tables of stats). You can also switch off headers and footers to clean up the output. In Internet Explorer, switching on printing of background colours and images is also necessary. Printing in Opera isn't really working. Graphs won't print, and the paths on maps don't print either. There is a new Seasons tab on the tag detail page that shows a table breaking down the activity for that tag by time of day and month of the year. 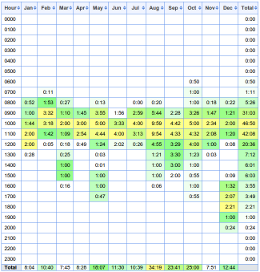 This can be used to see how your activity varies with the seasons. New battery change selection page. When a battery cycle goes over 75% of the average for a device, a warning link on the home page will appear. There is a new page to allow easily selecting the point when batteries were changed or charged. A summary of the current status of your goals (if you have created any) is now displayed in a "dashboard" on the home page. Download graphs: Graphs now have a little "save" icon that appears when you hover over them with the mouse. Clicking this will download the graph as a PNG file. Unfortunately, this won't work in IE and the graph doesn't include the labels and legends, so it's not all that useful.